If I set my mind to it, I can work through a loaf of pumpkin bread in a couple of days. I'm trying hard to not polish this loaf off before my husband gets any, but just in case, I made it a tad healthier by cutting down on the sugar and replacing the oil with yogurt and apples. The result? 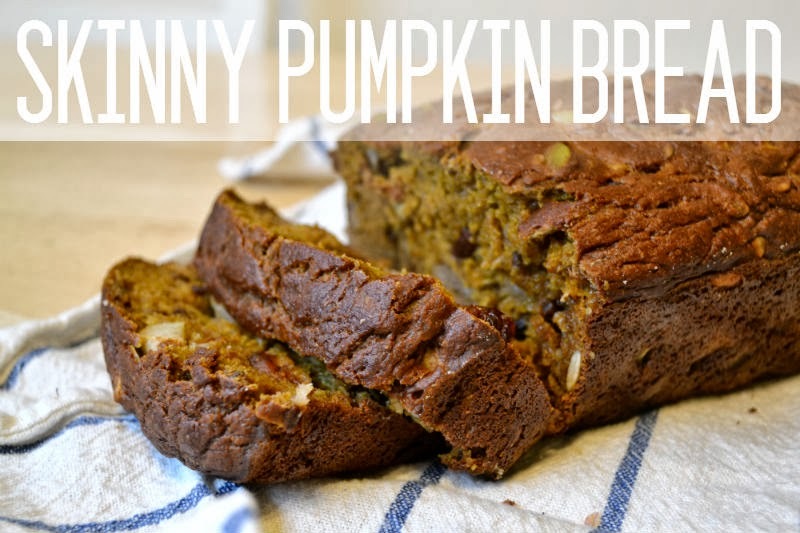 A super moist, pumpkin bread packed with the delicious flavors and textures of Fall. Trust me, you won't miss the sugar or the fat! 2. Whisk together your dry ingredients. Toss in the chopped apple and stir to coat. 3. In a separate bowl, combine the pumpkin, eggs, yogurt, maple flavoring, and brandy or water. Mix thoroughly. 4. Add your pumpkin mix to the dry ingredients along with the nuts, seeds, and cranberries. Mix until just combined. 5. Pour into a well-buttered 9x5 loaf pan. Bake 50-60 minutes or until your tester stick comes out clean. Turn out onto rack to cool before slicing. Idea: A slice of this pumpkin bread and few slices of sharp cheddar make a delicious lunch! yum, pumpkin bread is the best! i love this time of the year, so many pumpkin recipes all around!